Waterbury Clock Co., shelf "Albany", ca 1891. 24 inches high walnut case, original finish. Good original finials, fancy carved high arch top. 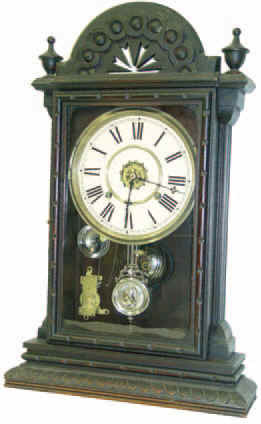 Everything about this clock is old and original except the replaced 8 inches paper dial. 8-day movement strikes the half hour and full hours on a wire gong with a nickel plated base. Alarm mechanism is still intact with a nickel plated bell. Clock works fine. This is the first time I've had this model to sell. Ly-Waterbury No. 1586.